I had yet another wonderful day in Belgium, a girl could get used to this. First off I would like to give a shout out of congratulations to my 6 foot 11 inch (210.82 cm) 16 year-old nephew Kevin who just made try-outs as one of only 19 juniors nationwide vying for 12 spots on the 2012 U.S. Boys' Youth National Team for Volleyball. If he makes the team he'll be competing at the Pan-Am games and the World Championships this year ,and his parents will likely be doing more traveling. Good luck Kevin! Now back to life in Belgium, I had a lazy morning lounging at the breakfast table in my hotel in Kortrijk talking to a very knowledgeable cycling fan from Britain. His enthusiasm would have been contagious if I hadn't already caught the bug myself. 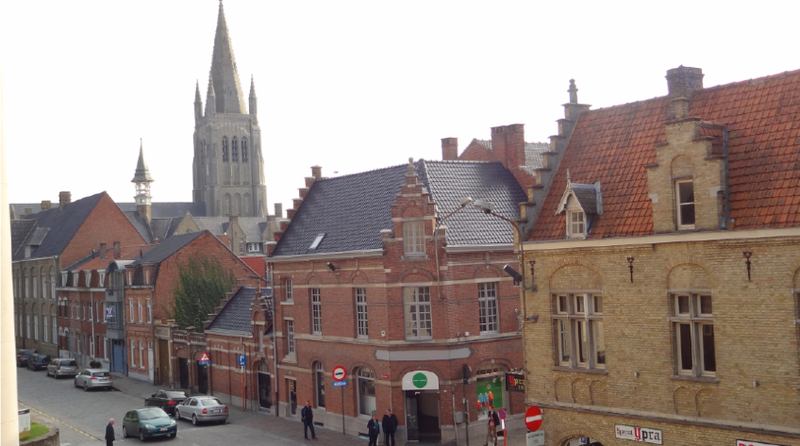 I checked out of my hotel in Kortrijk (Hotel Focus), stopped by the local Delhaize market 2 blocks away and picked up some lunch to go. Including a mini kugel. I have now tried a kugel - (it didn't last long enough to take a picture) it was delicious. 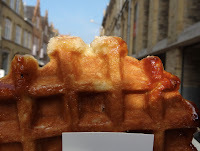 To date I have also enjoyed a waffle, frites, stroopwafles, and Belgian chocolate. I have tasted a Triple Karmeliat, Rochefort, Westmalle Triple, and your basic every day Jupiler beer. That makes 5 treats to 4 beers in 5 days. I'd say I'm one beer short at this point. Westvleteren 12 perhaps? Today I took a drive to the battlefields of West Flanders. 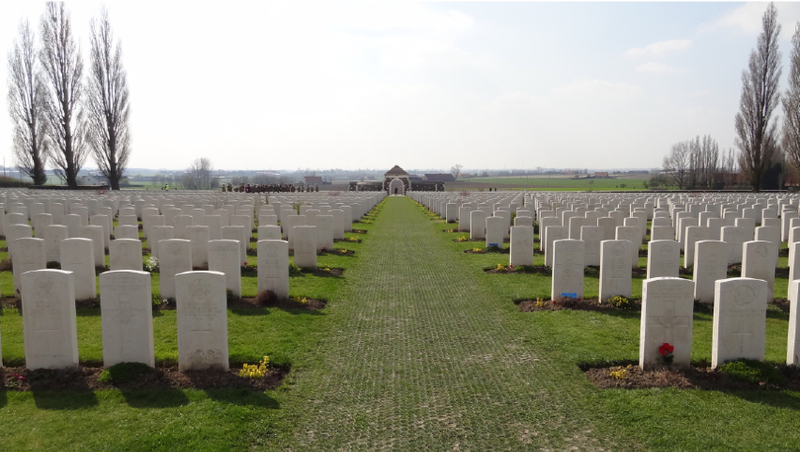 I visited the museum in Passendale (Passchendaele). The In Flanders Field Museum is closed for renovation until June 2012, so I stopped by Passchendaele Museum where one can walk through a simulation bunker, and then to Tyne Cot Cemetery, and finally visited the the city of Ypres (Ieper) and the Menin Gate. 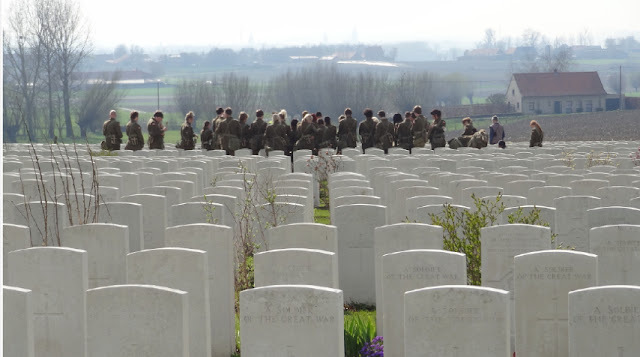 Although most of us had exposure to the story of World War I this year through watching the movie War Horse and the TV series Downton Abbey (I am a huge fan), my personal story is that my Grandfather Earl Bennet Rakestraw fought in five of the major battles of World War I. My Father's Father was a Command (Regimental) Sergeant Major in the 42nd rainbow division of the U.S. army and was later promoted by General Douglas MacArthur to First lieutenant (officer), the story is - because they played cards together, but more likely because my Grandfather was a good man. 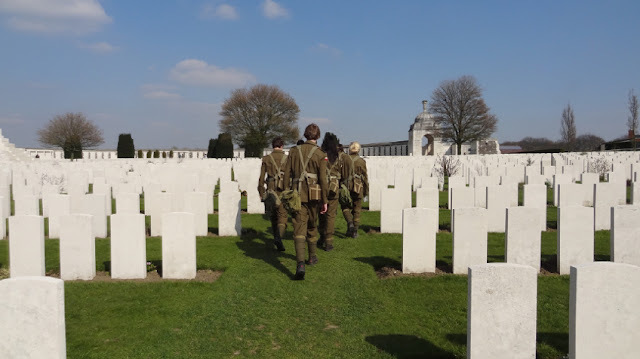 Walking the meticulously maintained fields of Tyne Cot was most touching when I started reading the names and ages of the men, and saw the notes of thank you and flowers left by those who still care about these soldiers. WWI was fought between 1914-1918. 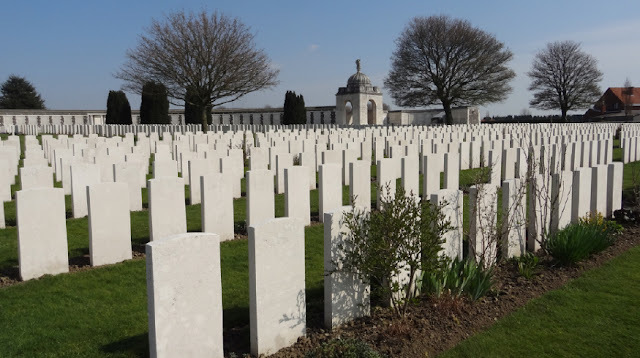 Tyne Cot is the largest commonwealth war grave cemetery in the world. 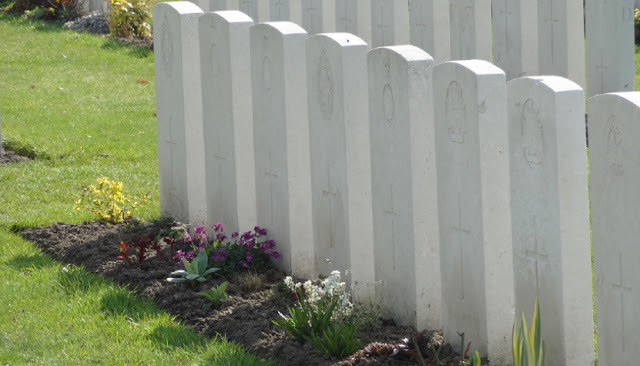 It is the site of approximately 11,400 grave sites. 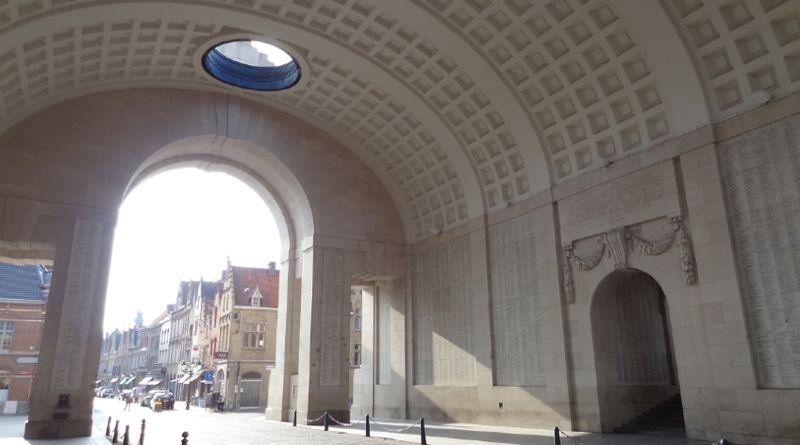 The walls bear the names of many thousands more who died in the Great War. 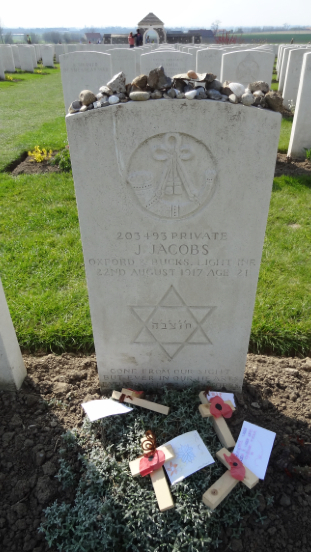 I thought of my Grandfather today as I walked these now green fields. 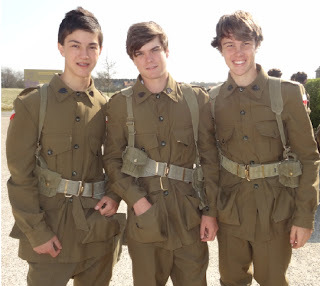 These young boys from Australia were on a platoon experience visit. They were almost the age of most of the soldiers who fought the war, many far from home. 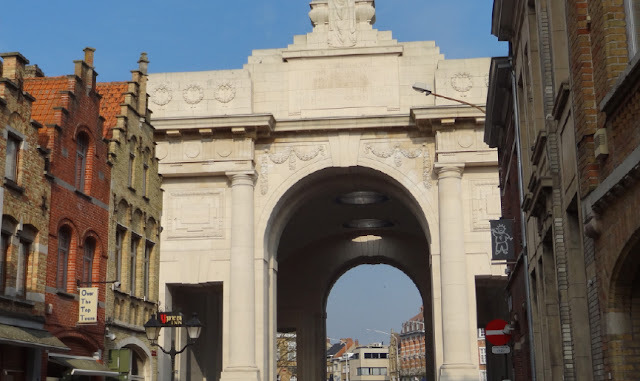 I drove into the town of Ypres passing under the enormous Menin Gate (a Belgian bugle corps plays the "Last Post" under the gate every night at 8:00pm). I liked this area and this town a lot. There were cycling lanes everywhere and green rolling hills. Such beauty in heavy contrast to the wars that have been waged over this land. 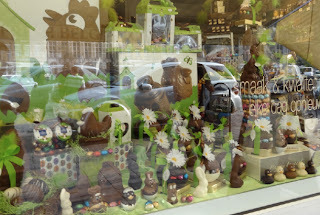 I also bought some more Belgian chocolates as gifts and found the most exquisite lingerie store (they carry Marlies Dekkers!). Belgium/Holland/France are manufacturers of some of the best lingerie in the world. Thank you for that. I have checked into a new hotel and this one is a keeper. I like it here a lot. Quiet, super clean, large rooms, friendly hosts, refrigerator of beer, perfect for cyclists - the Kwaremont and Paterberg are a few kilometers away. I dare to share it but this one is too good not to. 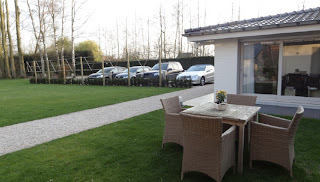 Team Astana stayed here last year with 20 persons for 11 days, but this year the team needed room for 30 and the small hotel could not handle them, the place was booked with happy cyclists instead. The owner said she cooked enormous pots of pasta for Team Astana 3 times a day. Maison Kerkhove. Fantastic. 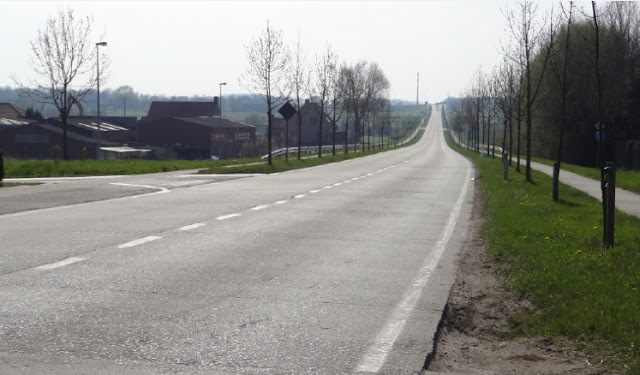 Day 2: Tour the climbs of Tour of Flanders: Paterberg, Kwaremont, Koppenberg, etc. Day 3: Visit the team hotels in Kortijk in the morning; Tourist day in Ghent.